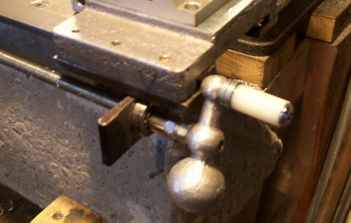 As you can see, the leadscrew crank handle bangs into the tailstock stand when you try to remove the tailstock. I seem to be taking the tailstock off and putting it back on a lot for some reason, so this is annoying. I plan on casting brackets that stick out further so I can take the tailstock off without having to remove my (planned) steering wheel style crank handle. Also plan on making a nicer bracket for the cross slide and compound slide feedscrew bearings. You can see my rollerblade bearing mod which is described in detail here. Based on "PukiWiki" 1.3 by yu-ji. Powered by PHP 5.3.2-1ubuntu4.5. HTML convert time: 0.046 sec.